Jason Lewis snaps opponent down in preparation for a varsity pin against Glenbard West. As the new year begins, the Dukes’ wrestling season begins its long 4-5 month trench. Last year the Dukes had zero wrestlers head down to state. Overall, the Dukes have had only three wrestlers win state since (1955, 1965, and 1976). This year it seems as if the Dukes have better intentions on taking a trip to Champaign, and maybe even come back with another name on “The Wall”. 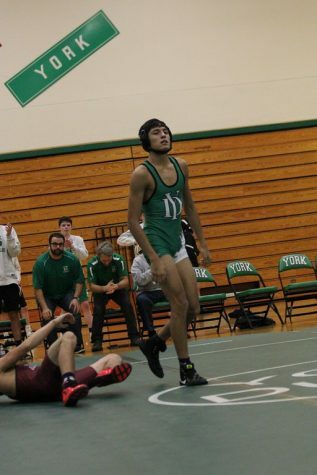 Antonio Gutierrez stand up with confidence leaving his defeated opponent on the ground he pinned him to receive yet another varsity win. The Dukes already have a record of 9-12 to start their season, but recently won the Kaneland Tournament this past weekend which they haven’t done since 2010. As of now, they stand proudly in third place in the West Suburban Conference Silver Division, behind OPRF and Hinsdale Central. Currently, the two leaders on the team are senior Antonio Gutierrez (25-6) and junior Josh Mathiasen (29-4), who has 25 pins and is trying to break the all-time season pin record of 29 (set by Harry Noffs in 2001-2002). After the tournament, junior Josh Mathiasen was able to give some insight on his future expectations and his favorite part about being a wrestler for the Dukes. In addition, I was able to get a hold of Antonio Gutierrez and ask him a couple questions on how the tournament went for himself, along with the team as a whole. It seems that wrestling is more than just a sport, it brings all the kids and coaches together as they begin to create their own family within each other. Nicholas Metcalf, the head coach for the Dukes wrestling team had similar feelings as his athletes about the team.